Spring has finally replaced Santa in Ohio. 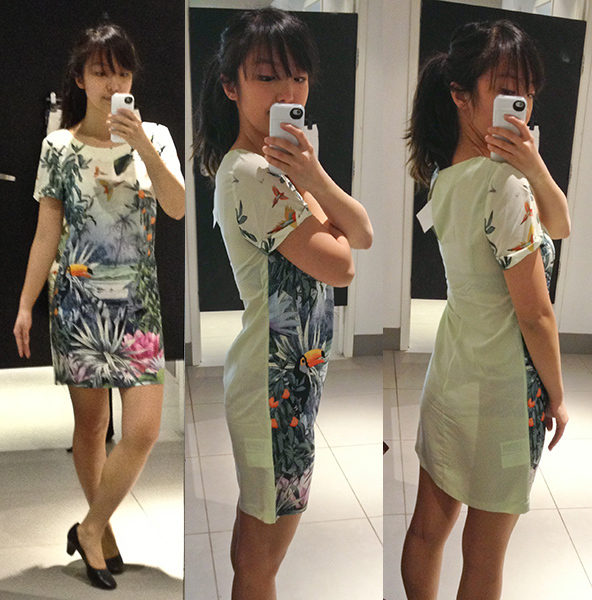 Every year I check out the H&M Conscious Collection because of the unique print and shapes they design. All dresses were 25% off last weekend, surprise surprise at the register. With my life and laundry overflowing with clothing, I think it's about time to be much more selective about buying new pieces and making sure that they can be multitasked for work and play. Somewhere along this process I've become more concerned about fit, which leads to more head shaking and less wallet busting in the fitting room. 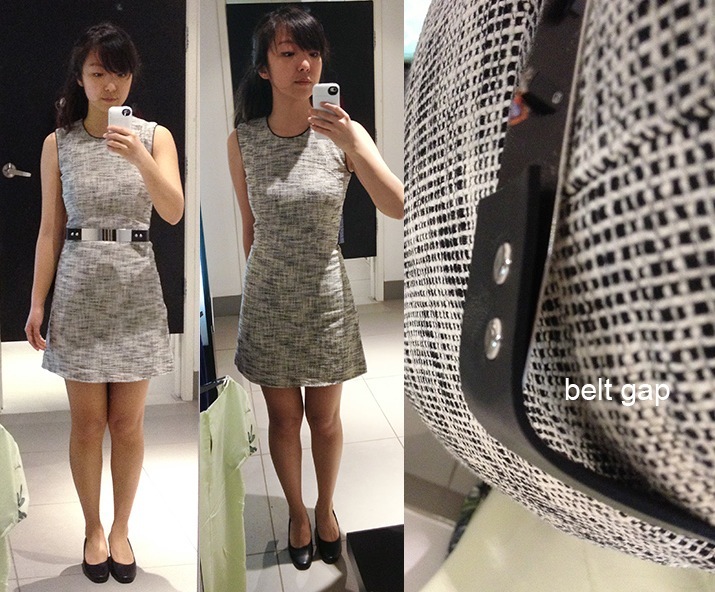 Debated for a long time whether to get this dress - the print is impractical and the material very thin and quite sheer. However, since it's blazing 80s suddenly, I figure this could be more highbrow with a white blazer, more tough with my leather jacket, and cute to wear on its own in a park setting, the botanical gardens, Coachella. The fit is quite good on me - have to wiggle in but once I pull it down it sits well at the shoulders, chest area, hips, and gives me some booty. - Verdict: Purchased but may return - what do you think? This dress fits me to the tee - even includes a little belly pooch after lunch. It reminds me of a space cadet girl from those 80s scifi shows on the future. It comes with a weird mirror belt that is super stiff and straight across like a bar. The back has a really long exposed zipper, which I enjoy the appearance of. The material is sturdy for its price but not unbreathable, so it can be worn for summer work days. While the length is not the most appropriate for work, throwing on darker sheer tights will help create the illusion. I can think of wearing this with a blazer, opaque tights in the colder season; as is; with a cropped top so it looks like a tweed skirt .. possibilities are good. - Verdict: Purchased: in my opinion, there is no good reason why a 20-something should wear tweed. It rarely looks flattering and matures you 50 years. However, this youthful cut and the lack of wild speckling makes it more suitable. 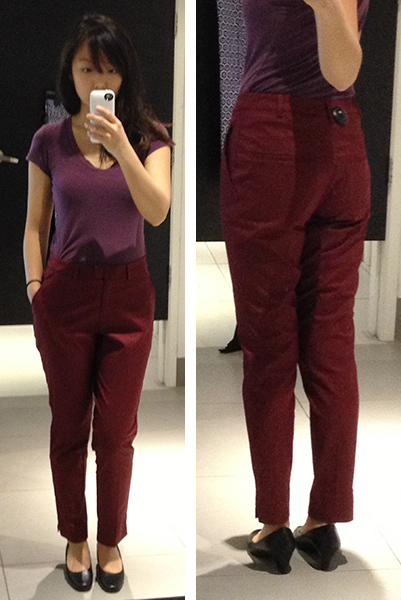 I spied this work-friendly pair in a random rack and saw that it was on sale and the wine red colour I like. The fit from the front was great with no weird bunching and they tapered along the length of my leg. Again, this is rare for my leg shape. However, the back-of-thigh bunching was very unsightly with extra folds because it's too big for my booty (not as obvious in this photo as it was in person). - Verdict: Passed - didn't want to try shrinking in the wash and I would avoid wearing these because of poor fit. Readers - did you pick up anything from this year's Conscious Collection? What do you think of the pieces? 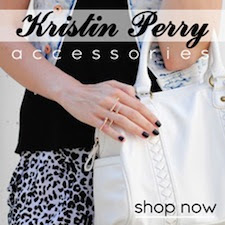 I love these items especially the grey dress. Great post! 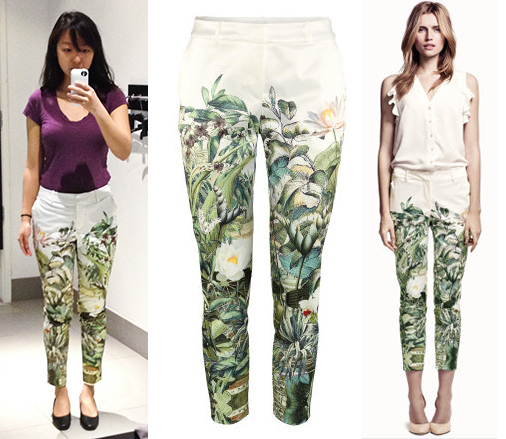 the flower pants is so cute! I really love the Rainforest dress on you! It compliments your body really well ^_^ The pants are pretty awesome too! OBBBSESSED with the whole collection! It's soooooo GORGEOUS!!!!! and that dress is so major! Looks sooo fab babe! 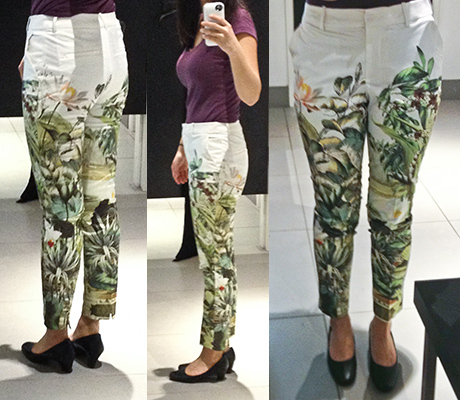 Those first pants look amaaazing on you, I don't care where you should wear them, you should have bought them. Agree on the tweed, only tweed shorts are ok, when you are young. I love H&M's latest collection! These items are so gorgeous. You look absolutely lovely! 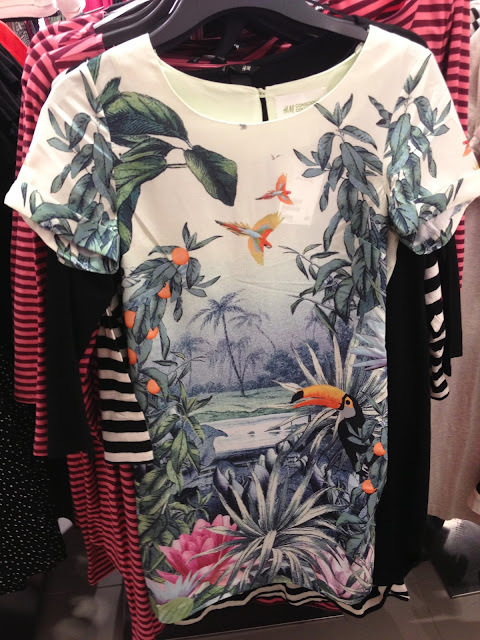 The rainforest dress *was* pretty but like you said, too sheer to be practical.